Bond is profiled on page 26 of the Oct. 7-13 issue of the Business Journal. Amelia Bond, chair of Webster University's board of trustees, was one of five regional leaders honored in the St. Louis Business Journal's 2016 Outstanding Directors Awards. Bond, who is president and CEO of the St. Louis Community Foundation and was previously a senior vice president with A.G. Edwards and Wachovia, is cited for her expertise and guidance with a complex institution like Webster. She is cited for underwriting the first "Critical Conversations: Embracing Diversity and Inclusion" two-day summit, and for her advising on how to reduce debt and improve Webster's bond rating. 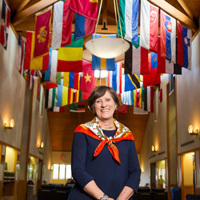 "Amelia has helped us grow our financial assets through smart investment strategies as well as leadership for philanthropic giving that has significantly increased our endowment, which has more than doubled in the past eight years," said President Elizabeth (Beth) J. Stroble in the Business Journal's profile of Bond. "Webster, like all universities, is not without its challenges, but the board has been a positive plaec and we've been able to help bring people through all of those changes and challenges," Bond said. Read the full profile online [sub.] or on page 26 of the print edition of the Oct. 7-13 issue. Sister Jan Hayes, adjunct faculty member and media ethics expert in the School of Communications, was on KTRS 550 AM's Martin Kilcoyne show Friday (Oct. 7) morning to discuss the ethics – and how it strays far from Webster's oustanding debate team -- deployed in debates and discourse of the current presidential race. Listen to her conversation with Kilcoyne here. It used to be a given, but it's changed in recent years: Retailers were always closed on Thanksgiving Day in the United States. Now the Mall of America -- the largest indoor mall in the country -- has pushed back on that trend, announcing it will be closed this Thanksgiving. Webster's Eric Rhiney, assistant professor and marketing expert in the Management Department of the George Herbert Walker School of Business & Technology, was quoted in a St. Louis Post-Dispatch story on the topic. “A lot of people feel like you’re taking away from the holiday spirit when you open on Thanksgiving, which is why people appreciate a decision like this,” he said, adding that the announcement could prompt other retailers and shopping centers to cut back on holiday hours. “Opening on Thanksgiving Day is not increasing the number of people who shop, it’s just spreading them out over more days, and Mall of America realized that,” Rhiney continued. Read the full Post-Dispatch article at stltoday here.